We are a full service company that provides our customers with Solutions to the various soils and conditions that each site presents. We are a Solution Provider with products that are not an all in one solution, each condition requires a selection of the correct product and application. Many seem to believe that one product fits all, unfortunately that has been proven to be untrue. Our company evaluates soils, aggregate, vehicle loads and vehicle passes as well as weather and intended use to define the appropriate selection of product and rates of application. Global Stabilization's application division ensures the proper protocols are followed to ensure success. Our customers range from the United States to Canada, Latin America and beyond all with very differing soils and load conditions. We are able to match the correct product and application rates to the existing soil conditions. We have taken this concept well beyond the normal and are able to manufacture a site specific chemistry to match the soils and conditions. This is unheard of in the industry as many companies are bound to their patents or available components that are linear in the broad spectrum of use. We believe in success one customer at a time. Recycle existing secondary roads reducing aggregate import for long term dust and erosion protection! Global Stabilization is a distributor of Earthbind® Products throughout the world in many industries. We have tried alternative products throughout many years and we prefer to apply Earthbind due to its performance in all soils. We can adjust the solution through dilution and application protocol to match the intended soil, aggregate, and native soils on many sites for extreme duty requirements. Earthbind is a Nano technology product, water is the carrier, for each one molecule of water, in the formulation there are three molecules of Earthbind. The water carries the product into the soil, aggregate, when the water evaporates the product remains bound and locked to the particles. We are a Non Ionic product, so we adhere to positive and negative charges soils further enabling Earthbind adhering to differing soils and aggregates. Earthbind® is an environmentally compliant product. Our application division allows us to ensure proper selection and implementation of application protocols and rates to assist our customers with our in-house services for product and construction services for complete control of the stabilization process. Our desire is to select the best protocol for each differing site at the most cost effective rates for dust and erosion control to ensure longevity working directly with our customers personnel. There are several options available with our EarthBind® Products for road and aggregate stabilization, dust abatement and alternative paving. Apply a topical application for aggregate roads to control dust from equipment and fugitive dust. Mechanical grinding of existing roads injecting our EarthBind® Stabilizer into the depth of stabilization as a liquid product. On site recycling grinding roads that are in need of repair or replacement. Recycle onsite materials and cold mix pave through a blending machine known as a Pugmill. This system eliminates the high cost of replacing old asphalt and transporting those materials off site and bring in new asphalt at an extremely high cost compared to The EarthBind Solution. EarthBind alternative is generally half the cost and obtains the same strength numbers. We also find we do not require as much base course aggregates before paving saving additional funds. Environmental concerns are now relieved for your storm water protection plans, EarthBind® is environmentally compliant! See attached links. We have our internal construction division that specializes in EarthBind® technologies as a one stop company for product and applications. Global Stabilization is an exclusive distributor for EarthBind® in North and South America as well a specific industries. I look forward to future dialogue with you to experience this new technology in your projects. "Unpaved roads are a water quality concern because of their hydrologic connectivity to streams or other water bodies. Any road segment that has a continuous surface flow path to a natural stream channel during a storm runoff event is termed a “hydrologically connected” road or road reach. Connectivity usually occurs through road ditches, road surfaces, gullies, or other drainage structures or disturbed surfaces. Road-related erosion has been identified as a significant sediment source in both the Napa River and Sonoma Creek watersheds." Apply Erosion and Dust Control of agricultural roads now and before winter rains with EarthBind®-100 and EarthBind® Stabilizer. Simply grade your roads and apply our EarthBind® to the surface to control dust and erosion. "Our product will solve this problem," says Bruce Coulthard President of PZS Stabilization, "unlike some dust control products, it will not wash away when the rains come, but will keep your sediment out of the waterways." The California Regional Water Quality Control Board for the San Francisco Bay Region recently determined that road-related erosion as a significant sediment source in both the Napa River and Sonoma Creek watersheds. and established new regulations for vineyards in the Napa River and Sonoma Water Shed. In place road stabilization with Earthbind® stabilizer for agricultural roads will solve the erosion issue at a fraction of the cost of alternative methods. Earthbind® can help vineyards achieve compliance with the order and protect the waterways. Learn more about Earthbind® for agricultural roads! There are several options available with our EarthBind® Products for road and aggregate stabilization, dust abatement and alternative paving. Environmental concerns are now relieved for your storm water protection plans, EarthBind® is environmentally compliant! See attached documents. 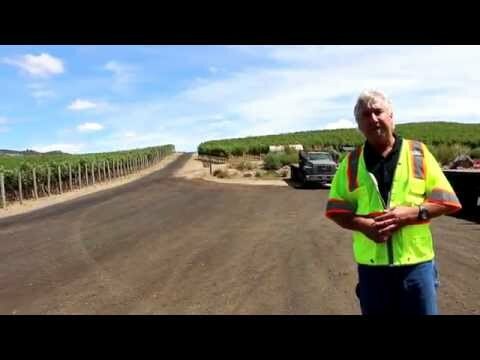 Earthbind® 100 is applied to successfully combat fugitive dust and stabilize the road surface on many different types of unpaved, low-volume roads, parking lots, vineyards. Earthbind® 100 is formulated with environmentally-friendly, biopolymers, and surfactants. As a dust palliative and soil stabilizer Earthbind® 100 works by binding loose soil or aggregate particles together, strengthening the soil/aggregate matrix and preventing even the smallest particles from becoming airborne as fugitive dust. In addition, Earthbind® 100 will add water resistance to the treated soil particles and will not re-solubilize in rainwater and wash off the road after curing. This is especially important in areas where the mitigation of sediment runoff from unpaved roads into streams is imperative. Dust Season is here, get a jump on protection from manmade and fugitive dust particulates with Earthbind® 100. Starting applications now will provide yearlong protection. Ask us about our spray bars that bolt to your onsite water trucks allowing for all operations to apply dust control internally on demand when needed saving additional application costs. There are millions of tons of RAP (reclaimed asphalt pavement) in piles around the country. Reuse it and save money, time and resources. Our Earthbind® products, when mixed with ground up RAP will rejuvenate your roads. EBS-RA is an environmentally friendly polymer modified asphalt emulsion for use in cold mix paving. EBS-RA was developed to replace toxic Asphalt Cutbacks. All components of EBS-RA are free of hazardous solvents and are not harmful to aquatic and mammal life. EarthBind®-100 Dust Abatement for Vine Health, Worker Safety and Waterway Protection! Get ahead of the potential spring summer damage now! We have refined our spray bar for many of our customers that find in-house dust control makes good sense from an “application when needed” standpoint as well as greater financial savings by using onsite equipment. The spray bar is easily attached to one of our totes while shipping our Earthbind®-100 for dust abatement, and you can easily bolt it onto existing water trucks or water wagons. Driving at 5mph at 50 psi applies 0.05 gallon/sq. yard which is one third of a base course or a maintenance application when needed. We simply ship 330 gallon totes of Earthbind®-100 when needed for base course or maintenance applications in high use areas. Contact us for orders or more information. We offer effective and environmentally sensitive solutions for erosion control with our Global Bio-Gen and EarthBind®-100 products. Global Bio-Gen promotes rapid root growth of plants and grasses with natural liquid biologicals to anchor soils in place. Our EarthBind®-100 will act as a temporary topical binder to hold the soils in place during rain and wind events until plant germination occurs with our Global Bio-Gen.
Unpaved roadbeds are typically composed of a combination of gravel, sand, aggregate stone, local soil, and other small particles. Throughout the course of a year, weather and seasonal changes can gradually start to affect the relationship between these various components. Rainfall, dry conditions, the changes of seasons, and the freeze-thaw effect can cause an unpaved roadbed to develop potholes, ruts, heaves, and significant wash boarding. Not only can these defects in the roadbed be frustrating for a motorist, it can also cause safety problems, increased maintenance costs, and potential damage to vehicles. Some operations and municipalities will turn to grading to effectively alter a roadbed that has been compromised. This essentially alters the loose association between the aggregate components to create a temporarily smooth surface. Unfortunately, this also includes an excessive amount of cost in man hours and fuel. With time and further weather changes, the graded roadbed will gradually deteriorate. In time, it might also require the expensive addition of gravels and new aggregate. To answer these problems and reduce grading costs Global Stabilization offers Earthbind® Stabilizer. This is a versatile bituminous modified biopolymer and soil stabilization agent. It was developed to meet the salient demand for a high quality and cost-effective soil stabilizer and dust palliative. It can be safely stored in its concentrated form. When needed it can be diluted to the appropriate ration and easily applied to an unpaved roadbed. Earthbind® Stabilizer has been formulated to create an effective matrix between aggregate materials, soil, and fine particles to bind them together. This provides the unpaved roadbed with increased density and stability. This helps to save costs by reducing the annual need for grading, replacement gravels, and other maintenance measures. If you need help reducing maintenance cost for unpaved roads, you should call Global Stabilization at 1-707-287-6111. Earthbind® is a unique and environmentally-friendly product specifically engineered to be a quality and effective dust suppressant. Earthbind® is considered to be a biopolymer modified bitumen emulsion. Earthbind® is made by EnviRoad® LLC, an ISO 9001:2008 certified company. Earthbind® is manufactured in Portland, Oregon U.S.A.
Earthbind® is effective as a dust suppressant on many types of soils/aggregates. The main competitors of Earthbind® are the salts, lignosulfonates, synthetic polymers, mineral / paraffinic oils, petroleum resin, and traditional asphalt cutbacks/emulsions. Follow this link for a brief description regarding how Earthbind® differentiates from its competitors. When we topically apply or shallow inject our EarthBind® Products into the top 2-3 inches of roads, you get road stabilization with dust control at no additional charge. This is all at a fraction of the cost of asphalt paving and best of all it is environmentally compliant. This is a long term solution saving a lot of money in reducing application frequency. The cost of mite damage and air particulates harming workers in itself a significant add back in addition to the potential for silt infusion into our waterways. These applications should be performed prior to winter to stabilize roads from erosion pressure. The stabilization will follow into the spring for dust control all season long! Our application division can perform a turnkey installation or we can assist the company with proper application protocols with their own equipment. EarthBind® Products are a solution provider! “Apply Erosion and Dust Control of agricultural roads now and before winter rains with EarthBind®-100 and EarthBind® Stabilizer” Simply grade your roads and apply our EarthBind® to the surface to control dust and erosion. Keep your sediment out of the waterways! Earthbind® 100 is a quality, versatile and environmentally-friendly modified biopolymer dust control agent. Earthbind® 100 was developed to meet the need for a quality and environmentally-friendly product that can be safely stored and easily applied. Earthbind® 100 is applied to successfully combat fugitive dust and stabilize the road surface on many different types of unpaved, low-volume roads, parking lots, railroad yards, etc., throughout industrial, mining, military, private and public market sectors. Ask us about our spray bars that bolt to your onsite water trucks allowing for agricultural operations to apply dust control internally on demand when needed saving additional application costs. Dust Control on Agricultural Roads Is Now! Several options to fit your specific issues, short term, midterm or long term control, call us for pricing. Magnesium chloride is commonly used as a dust suppressant agent on unpaved roads in the western parts of the United States during the spring and summer. Likewise, magnesium chloride is used extensively for deicing/anti-icing on paved roads during the winter. Magnesium chloride is often used as a dust control agent since it is hygroscopic and deliquescent -- it has the ability to absorb moisture from the humid air. This absorbed moisture helps limit dust by keeping the surface of the road damp enough to hold the dust particles down and reduces blow-off as fugitive dust. however, this discussion will focus on the salts impact on roadside vegetation. purposes have demonstrated similar symptoms to those as sodium chloride. Even though magnesium chloride is extensively used for deicing purposes, the potential impacts of the salt on roadside soils and vegetation may be much greater when used as dust control agents. When magnesium chloride is used for dust control the pathway for chlorides to vegetation is washing/leaching off a road (mainly downslope) into the soils with rainwater or snow melt. A study done by Colorado State University has documented elevated salt concentrations between 9-foot and 320-feet from roads. The notable effects that chloride has on vegetation include leaf scorching, marginal necrosis, and needle tip burn. High concentrations of chlorides in soil can affect plant growth and survival both indirectly and directly. At lower chloride concentrations, a reduction in plant growth may be due to osmotic effects that disrupts normal water and nutrient uptake. At high concentrations, chlorides can accumulate at the margins of transpiring leaves or the tips of needles which can cause foliar necrosis and leaf abscission through dehydration and/or specific metabolic disruptions. These could lead to branch and tree die-back. Usual symptoms appear as browning of the leaves beginning at the tip or margin of the leaf and advancement towards the base. The higher the chloride content the greater length of the leaves are injured. In addition, during dry conditions, water stress and dehydration may aggravate chloride toxicity and cause even more extensive damage. Research has shown that injury can occur when the needle/leaf chloride content reaches 5,000-ppm (dry weight) in conifer trees and 10,000-ppm to deciduous species. This may sound like a lot of chloride but it may not be on a roadside that was treated with magnesium chloride. For example, if you apply ½-gallon of a 30% solution of a magnesium chloride solution, you are applying approximately 1.2-pounds or 544,311 milligrams of chloride per square yard of road. The amount of chloride is staggering when a typical one-time application of magnesium chloride may contribute 11,358 pounds of chloride per mile on a 16’ wide road! Obviously roads treated more than once a year will greatly increase the chloride concentration. And since magnesium chloride is highly water soluble, 54,200 milligrams per liter, it is easy to understand why it can leach and run-off a treated road so easily. Earthbind® is a unique and environmentally-friendly product specifically engineered to be a quality and effective dust suppressant. Earthbind® is considered to be a biopolymer modified bitumen emulsion. Earthbind® is made by EnviRoad® LLC, an ISO 9001:2008 certified company. Earthbind® is manufactured in Portland, Oregon U.S.A. Earthbind® is effective as a dust suppressant on many types of soils/aggregates. The main competitors of Earthbind® are the salts, lignosulfonates, synthetic polymers, mineral/paraffinic oils, petroleum resin, and traditional asphalt cutbacks/emulsions. This document is a brief description regarding how Earthbind® differentiates from its competitors. Controlling your silt runoff and dust is simply the right thing to do! Global-PPE is available in 5-gallon, 1000-1200 liter totes, 5000-20,000 truck/ bulk rail tankers. Simply grade your roads and apply our EarthBind® to the surface to control dust and erosion. Keep your sediment out of the waterways! Do You the Grower Know About This? The new best practices act will most likely be implemented in time, and for all the reasons. The fine dust particulates from watering roads instead of stabilizing the roads contributes significantly to the silt ending up in our waterways. We have already implemented our EarthBind®Products into the US Railway system as they were concerned with runoff in order to comply with their SWPP guidelines, as well as mining operations worldwide, etc. The cost to stabilize ag roads is only in the $15-$20 cents per square foot for product, delivery and application by our PZS Stabilization, and less expensive if the farmer applies it himself with our bolt on spray bars to water trucks. This is a very important time for all farming entities to be proactive, the cost is much less than one would think using our EarthBind®Products, as they build inventory through time not wash away. Earthbind® 100 is a quality, versatile and environmentally-friendly modified biopolymer dust control agent. Earthbind® 100 was developed to meet the need for a quality and environmentally-friendly product that can be safely stored and easily applied. Earthbind® 100 is applied to successfully combat fugitive dust and stabilize the road surface on many different types of unpaved, low-volume roads, parking lots, railroad yards, etc., throughout industrial, mining, military, private and public market sectors. Portland, OR June 2, 2016– EnviRoad®, LLC announced today the company has been awarded the distinction of ISO 9001:2008 certification. This is a benediction of the company’s ever increasing commitment to providing customers with the highest levels of quality road emulsion products. EnviRoad’s ISO 9001:2008 certification was received from IMSM, Inc. The ISO 9001:2008 certification confirms that EnviRoad has met all the ISO standards and requirements for the company’s Quality Management System. Obtaining the ISO certification was a rigorous process that required months of preparation, reviews and audits. Achieving high levels of customer satisfaction and establishing processes for continuous improvement are important components of the ISO 9001:2008 certification process and align with the company’s commitment to excellence in the delivery of road emulsion products. Dust Season is here, get a jump on spring and summer protection from mites and fugitive dust particulates with EarthBind® 100 Starting applications now will provide yearlong protection. Ask us about our spray bars that bolt to your onsite water trucks allowing for agricultural operations to apply dust control internally on demand when needed saving additional application costs. ï· Earthbind® does not wash off with rain rainwater as the chlorides do. not require humidity to control dust as chlorides do. ï· Earthbind® does not get sloppy or slippery under wet conditions as the chlorides can. ï· Earthbind® is specifically formulated and manufactured to be a dust control palliative. It is not a byproduct or “waste” product such as chlorides. need to pre-water a road prior to application. Chlorides typically require a pre-water application. ï· Earthbind® is not considered to be corrosive. Chlorides are. and magnesium chloride have been reported to do. chloride treated roads. Larger mammals attracted to a road can be traffic hazards. product because of this build up. Chlorides can wash off the surface. road material to hold water. A gravel or dirt road’s most typical problems are caused by water. Typical problems include rutting, soft spots, depressions, and potholes. PZS Stabilization LLC is an exclusive distributor for Aggresol DCO, an environmentally benign dust control agent that actually works that will outperform any OMRI certified product on the market. We have completed two years of aggressive trials in the extreme duty mining industry and are satisfied we can assist agricultural entities with the same level of protection from fugitive dust and erosion. AGGRESOL- DCO is incorporated into the top 1-2 inches of soils and aggregate at a 4:1 dilution rate. Road builders are faced with shrinking state and federal budgets. Global Stabilization provides a cost effective alternative to traditional aggregate import and asphalt paving. Our solution: regenerate the existing aggregates and asphalt in place by mechanically injecting our Earthbind® Stabilizer providing long lasting stability and dust control. Global Stabilization is a Distributor of Environmentally Sensitive Road Building Products to reduce erosion and dust throughout the world. We are aware of the significant issues regarding dust control compliance for fugitive dust and erosion control measures and storm water protection plans in agricultural operations. Photosynthesis reduction and mite damage is also a real concern. We have several application options available knowing that one size does not always fit due to different vehicle passes per day and the type of equipment crossing the treated roads. We provide a bolt on spray bar for water wagons or water trucks with the appropriate gallons per minute nozzles. The customer orders our EarthBind®100 in 330 gallon totes and applies per our recommendations. This method is very popular as well due to the amount of dust control and expenditures can be determined by the onsite manager when required. Follow up maintenance when needed in high use areas can be performed on an as needed basis. · We will be announcing our OMRI Certified dust control product February 15, 2016. After several years of trials in the extreme duty mining industry to ensure compliance and effectiveness we are now confident we can address the customers that require an OMRI product that actually works and lasts. · PZS Stabilization’s construction division can perform all levels of applications in the US and our Latin American division. · Maintenance applications must be in your overall cost benefit analysis and operations. Wear will occur and if maintained pro-actively, the base course will be protected and will continue to build in inventory. EarthBind® products will not wash away they continue to build inventory and maintenance becomes less each year. UV and high heat increase the strength of the road surface and increases traction, unlike products that become slippery when wet. · In arid conditions we use a 25% annual maintenance number. If you apply 10,000 gallons, plan on an additional 2,500 gallons for annual maintenance. Year two and on you will not need the base course applications just the maintenance numbers. PZS Stabilization LLC, www.pzsstabilization.com is our construction company and Global Stabilization LLC, www.globalstabilization.com is our product sales company. Aggregate is an expensive maintenance cost to replace, EarthBind® Products lock the aggregate into place and virtually eliminates the need for continual import, grading and compaction with water. Those costs are substantial! We are onsite for all training with new customers, to ensure our application protocols are adhered to for successful erosion and dust control. We have been asked for some six years for an ”Organically Certified Dust Control Product”. After two years of testing under extreme mining conditions we will be offering this to growers that are in dire need of a product that will last the entire season with minimal maintenance and water consumption! We will be making additional announcements over the winter and have this in place at all of our western US locations. Finally an OMRI certified product that actually works! PZS Stabilization appllies an environmentally friendly and cost-effective solution to solve the dust problem at Silver Oaks Cellars Vineyards on Atlas Peak in the Napa Valley.